When we’re not banding birds, we’re searching out bird nests and monitoring them. This means that, at three of our banding sites, we also look for nests. We’re targeting four species of birds: Yellow Warblers, Black-headed Grosbeaks, American Robins, and Song Sparrows. Why do we do this? Well, we’re interested in the productivity of the birds– how many babies are they having, and are those babies fledging, or surviving long enough to leave the nest. One of our research aims is to study as much as we can about the survivorship and productivity of the birds in the area, since birds are an excellent indicator species. What is an indicator species you ask? Something like the indicator light on your car, actually. Birds are highly sensitive to changes in their environment, so if the birds are disappearing it can mean something is up with the ecosystem. The causes of their disappearance can be as mysterious as the reasons for the check engine light to come on, but with greater consequences for the world (see “Silence of the Songbirds” by Bridget Stutchbury). Up close and personal with a beautiful male Yellow Warbler. His feathers are a little ruffled because of the wind. And yes, those are the Tetons in the background. We banders are busy people, setting up mist nets and banding birds for six hours every day, so we have lovely crews of Earthwatch volunteers assist us with nest searching. Earthwatch is an organization that organizes groups of volunteers from around the country to travel to different places around the world to participate in “scientific field research and education in order to promote the understanding and action necessary for a sustainable environment.” It’s a pretty cool group, and so far all of the volunteers we’ve had come visit have been absolutely outstanding. Here’s their website, if you’d like any additional information: Earthwatch. 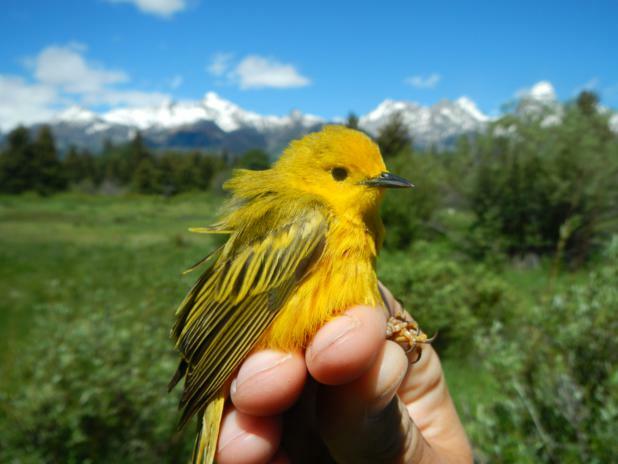 If you want more about the Earthwatch Expedition that deals specifically with our work here in the Tetons, then check out this link: Spotting Songbirds in the Rockies 2013. Every week the volunteers search for nests, and then we banders are in charge of monitoring those nests, or nest checking, twice a week (on Mondays and Thursdays). Usually this takes place after we are done banding for the day, and we’ll divide and conquer to check the nests at all three sites in a reasonable amount of time. Sometimes, despite our best efforts, it still takes a long time. Bird nests are not always easy to find. When a nest is found, we take a GPS coordinate, compass bearing, and also fill out a nest card, with a hand-drawn map and written description on the back. 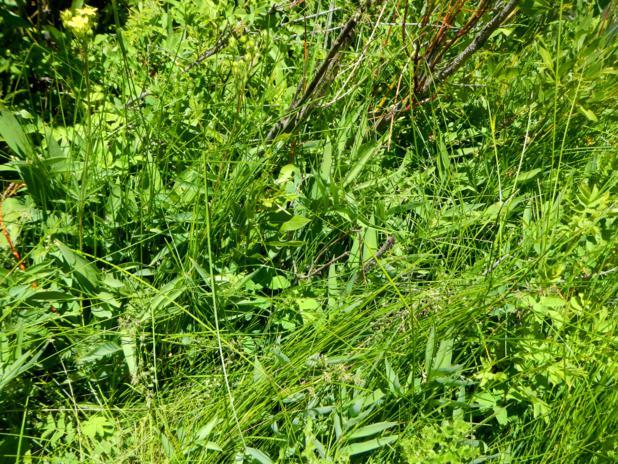 Despite this, some nests can be extremely hard to find. (See The Bad, below). Finding nests, and having the baby birds fledge successfully. Watching them flop around in the bushes, learning how to fly, can be quite amusing. 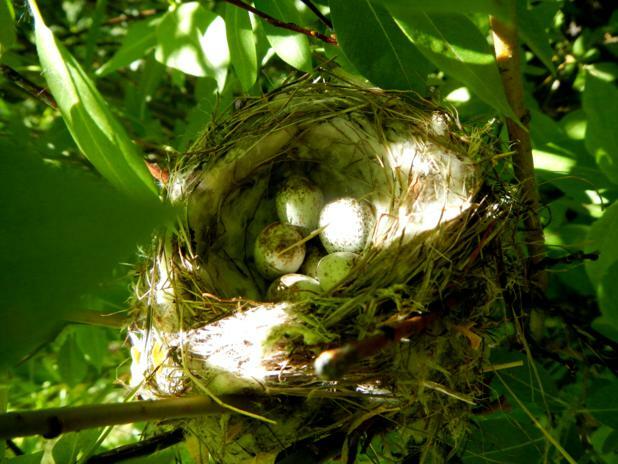 A yellow warbler nest with five eggs. To make a nest, a female yellow warbler makes a cup of grasses, bark strips, and other thicker plants, and then lines it with softer materials like animal hair, feathers, and plant fibers. Their nests are usually around 10 feet off the ground, though many that we monitor are not that high up. 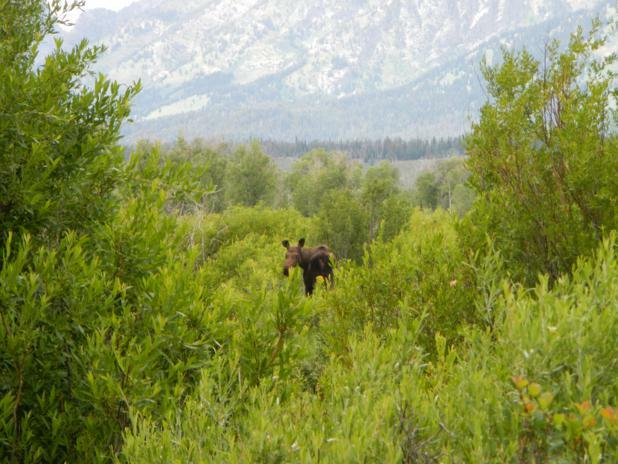 A female moose at Blacktail Ponds. She was not impressed with my thrashing through the willows looking for nests, disrupting her afternoon amble. She posed for a minute, and then slipped away into the willows. For such giant creatures, moose can be surprisingly swift and sneaky. I didn’t see her again. How high up is this push pin? What color is it? Is it to the right or left of this cottonwood tree you could have used as a landmark? Do I have to cross this stream, which you also could have used as a landmark? The fact that we usually don’t start nest checking until after we’ve banded for 8 hours probably doesn’t help much either (my morning coffee has definitely worn off by then). Or the fact that it’s hot, and by that point the mosquitoes have made themselves known. In an attempt to find one particularly frustrating nest, I found a cedar waxing and then a gray catbird nest before I found the black-headed grosbeak nest on the card. At least I knew it wasn’t that I had suddenly lost my ability to locate bird nests. On the whole, though, most of the nest cards give very good directions, and make it fairly easy to find the nests. There are only a few particularly memorable bad nest cards that make me want to pull out my hair and scream. Which isn’t such a bad thing, the screaming at least, because it lets the moose and bears know where we are so we can’t accidentally surprise them. Which is not something I’d recommend. A song sparrow nest. Song sparrows are typically ground nesters, and the female does all the work to build the nest, though the male does help her pick the perfect spot. She makes it out of grass, and will line it with more grass and animal hair. Nests are 4-8 inches across, and 2.5-4 inches deep. Can you spot the song sparrow nest? I thought not. It’s directly underneath the branch on the right, directly under a blue pushpin that you can’t see in this picture. Song sparrow nests are extremely difficult to find, and most are found through a combination of pure luck and many minutes of careful observation of the adults, to watch as they visit the nest. Baby birds are ugly. I don’t care what anyone says, these things are not cute, especially before their feathers grow in. After they are fully feathered, they’re much more attractive. 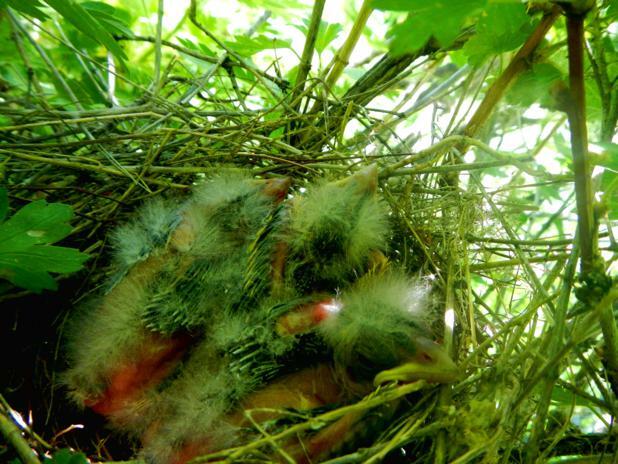 Black-headed Grosbeak nestlings, about 7 days old. And super ugly. Notice how the feathers on their backs and wings are in tubes, which are called pin feathers. These are their feathers growing in, and have a blood supply flowing through them. As the feathers grow longer, the blood supply will concentrate just in the base of the feather, and the bird will preen off the sheath so the feather can unfurl. Feathers are fascinating, and you can read more about them HERE. 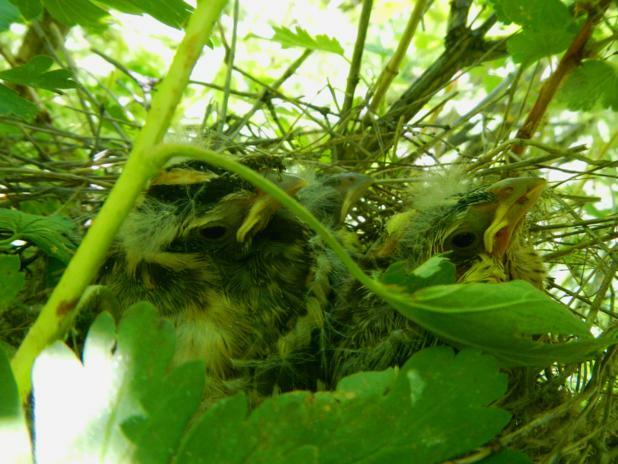 The same black-headed grosbeak nestlings at about day 12. Slightly cuter, but still pretty ugly. Note their gapes, or the lighter corners to their mouths. This is a typical characteristic of baby birds. Gapes are usually brightly colored, and they inform the parent birds about the baby’s level of need, health, and competitiveness, which the parents use to decide who to feed first. The louder, more obnoxious nestlings get fed first, and more often, than the quiet ones. I probably would have starved if I was a baby bird. My siblings were not what one would call demure young children. 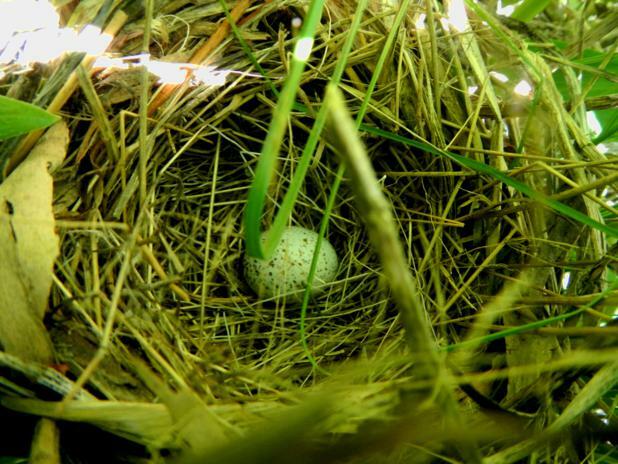 Now get out there and find some bird nests of your own to monitor!